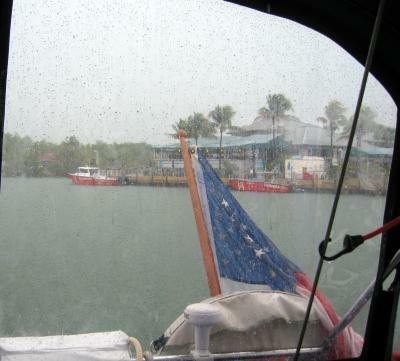 Black Point Marina – Rain, rain rain…. Black Point Marina – At last we sail! 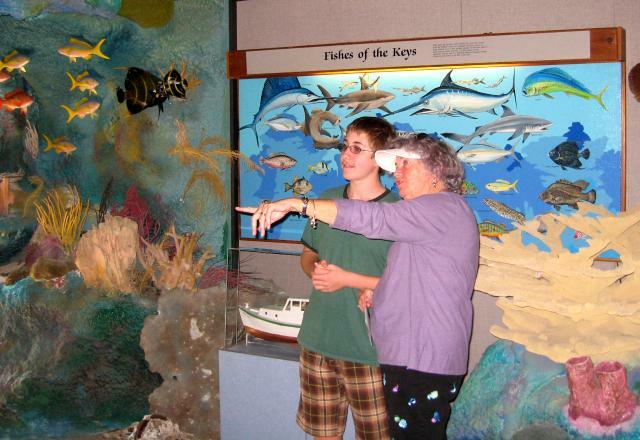 As part of Matthew’s home schooling, he’s learning about Florida’s history and the local sea life. There’s an excellent Florida history site put out by the state which comes complete with a teacher’s guide and suggested quiz questions. 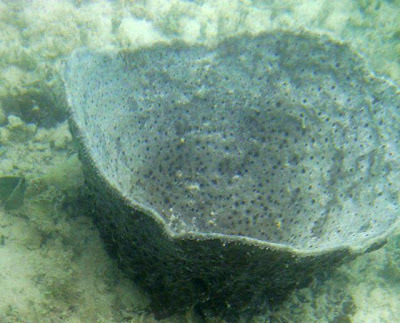 I printed the guide for Ann and we also went on a “field trip” identifying sponges we could see under the dink and took lots of pictures. Matthew is an excellent diver so he also dived on the anchor to get a photo of how it’s dug in (see photo). In taking Hoolie to the deserted island there always seems to be a boat visiting for the same reason so Hoolie usually has a running pal. They just run and run and run. Unfortunately, Hoolie is getting more accustomed to the water and so longer avoids it. The result is a constant desalting of his coat with fresh water and toweling off with confinement to the cockpit until he’s completely dry. A wet dog down below is no fun. We are far enough south to see the Southern Cross, just 10 degrees above the horizon. It’s visible at 3:00 am so I’ll take a look out then to see if any clouds are in the way. It’s a beautiful constellation and I always like to see it whenever possible. Tuesday morning we’re headed for Key West to start our February sojourn there. 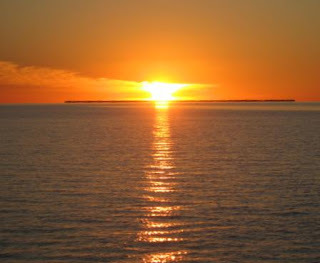 There is a very pretty uninhabited island by our anchorage – which is the reason we chose to anchor here. 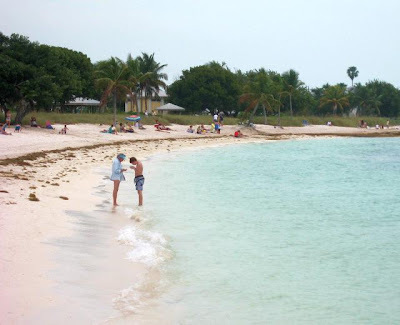 On weekends it’s very popular with many boaters taking advantage of the sandy beach for weekend getaways. 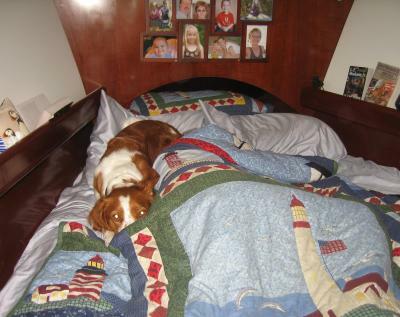 It’s also a meeting place for dogs of all types. They run free on the island, brought there by the visiting boaters. Hoolie landed and met many friends – ran constantly but he never seemed to get exhausted. Eventually all the boaters left before sundown and we had the island to ourselves for Hoolie’s evening relief. It’s pitch blank at night and we have to use the chartplotter to find out in which direction to leave the boat to reach the island, kinda of eerie. The weather has turned warm and the winds have subsided with temps in the 70’s and our anchorage is flat calm at the moment. I wouldn’t want to ride out a storm here but in this weather it’s ideal. 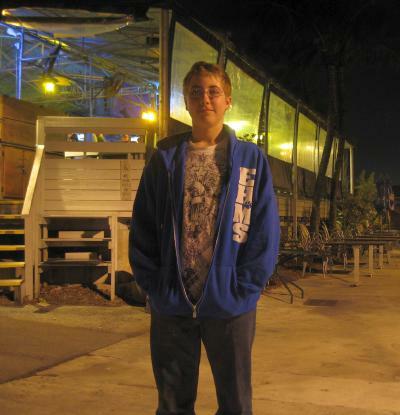 Tomorrow is Monday and another school day for Matthew, he’s way ahead of his classmates who have endured many snow days – such is the advantage of home schooling in Florida! ﻿ We had hoped for 10 to 15 kts out of the northeast but got 5 kts instead so we had to motor the way to Newfound Harbor, about 20 nm away from Marathon. 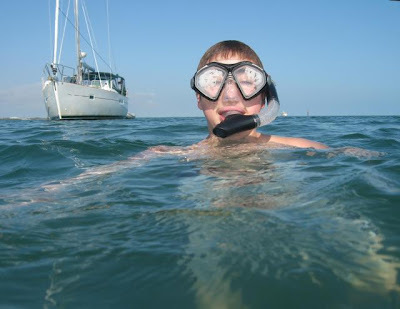 There is a marine park with moorings for snorkeling just outside the harbor entrance but when we approached the mooring buoys they appeared to be right on top of the coral so we backed off given our 5 ft draft and went on to our anchorage inside the harbor. We had looked at local recommendations for places to anchor and chose to drop the hook right off a local island favorite that was not in the charts as an anchorage. It’s a great place since it has a sandy beach for Hoolie and 7 ft depths for us but you have to find your way in following the charts carefully since there’s lots of shoal water on either side of the anchorage. For the first time since Maine we saw an Outward Bound boat. 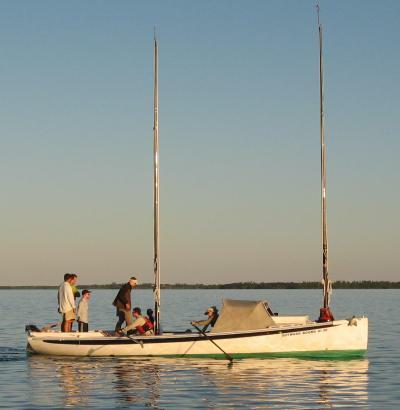 There were eight in the boat and they typically go out for a week at a time with a lot of team building events, sleeping in the boat at night. The boats are recognizable with their two masts and pointed ends. The island got in the way of our "green flash"
We were hoping the sun would set over the ocean to give us a chance to see the “green flash” but there turned out to be an island in the way, too bad – it was still pretty. It’s dead quiet now and hopefully it’ll stay that way for the night. Marathon does have some key services required by boaters. Across the street from the marina is the Chevron gas station where you can get your propane tanks refilled (before 10:00 am or after 4:00 pm). 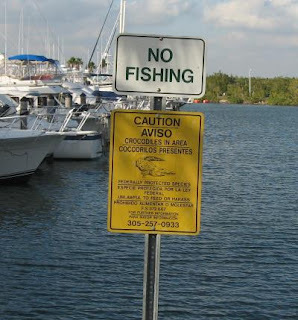 There’s a Home Depot, a Publix and a West Marine store – all very useful to boaters. 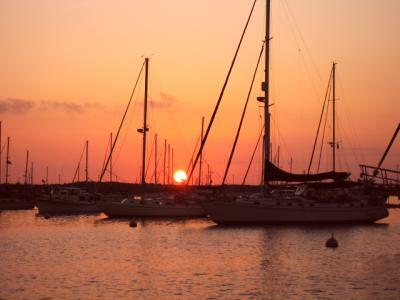 There’s a 9:00 party line call on VHF channel 68 where boaters trade spare supplies and announce events for the day such a Yoga classes and art classes. 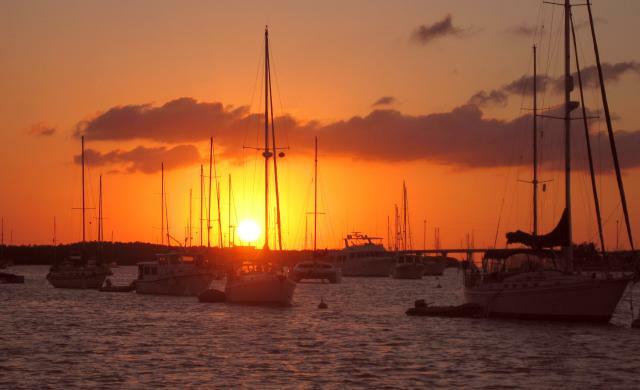 I can see why some boaters call Marathon home for the winter, but not us – we’re headed to Key West! You would think that in the Keys (or anywhere in Florida for that matter) there would be a fish market on every corner. No so! For some unknown reason they are few and far between – if you can find them at all. Sure, you can find fish in supermarkets but that’s not the same as fresh catches from a local store. 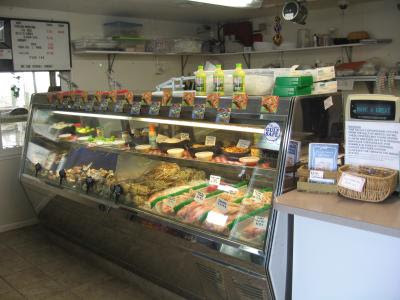 Well, we found such a market in Marathon, it’s called The Keys Fisheries (see photo), we especially recommend the shrimp. Ann used their shrimp in a delicious recipe tonight, just great. Paul plowing our driveway for the 6th time in one month! Meanwhile, we seem to keep getting battered up north. For the sixth time we’ve been plowed out by Paul and this is only January! You can see Paul and his truck from our webcam which we use to remind us of how snowy the north country can be. Surely it can’t stay like this all winter?! However, it’s supposed to warm up down here to the 80’s by early next week just in time for our arrival in Key West. We took on 140 gallons of water today so we’re all set for the last leg of our trip south. I was getting ready for my morning run when the heavens opened up with rain, wind and lightening. With that introduction to the day, I went back to bed. The front had come through around midnight with a gust of wind and rain but it wasn’t done by morning evidently. One thing about being on a boat is that you’re very aware of the weather, you are a participant, not a spectator. You’re constantly looking at the sky, weather reports, wind predictions and paying attention to all signals on the weather. So today was not such a great day. However, we were not able to get any sympathy from our son’s family in Connecticut! They were expecting their 7th storm of the season with 6 to 12 inches of new snow to fall along with an assortment of rain, sleet and freezing rain. We thought temps in the 60’s were a little chilly, again – no sympathy, go figure! While dodging storms, we saw a translucent object go floating by. 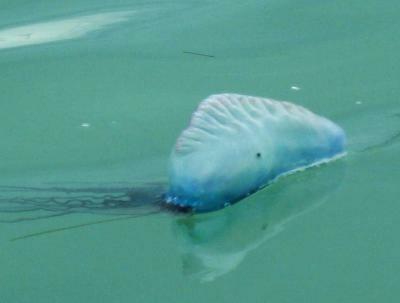 Upon closer inspection it turned out to be a Portuguese Man-O-War! The tentacles stretched out for at least two feet, maybe further. 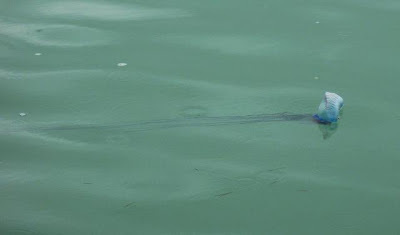 You don’t want to run into one of these while swimming! He was just drifting with the tide and winds as we photographed him. Matthew has been swimming off the back of the boat to cool off in the heat but we’ll be a little more careful in the future in looking up current and up wind as to what may be coming. I refilled the dinghy gas tank today and once again found that many if not most of the gas pumps for marine use in Florida come without the 10% ethanol addition that you find with fuel for cars. I hadn’t realize that it’s legal to do that but it’s all over Florida. Thursday is predicted to be sunny but cooler, I guess it’s part of the northern cold front with temps only in the upper 60’s, but we’ll manage. The day didn’t dawn very well, it was overcast and spitting rain but we decided to rent a car anyway. We drove to Crane Point which is a nature conservatory, an island of green surrounded by houses and other development. They specialized in saving injured birds and they even had two that were blind from cataracts and were being hand fed daily since they couldn’t see their food. Most were recovering from broken wings or other ailments that would heal leading to their eventual release back into the wild. As we entered the park, the sky cleared, the sun came out and the air warmed up into the 80’s – a spectacular day. It’s an educational area with a museum that simulates being in a coral reef. 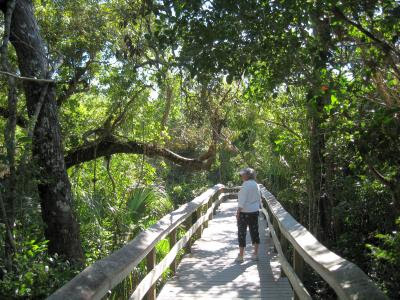 The trails have many stops along the way explaining the native trees and animals. In all a very interesting experience, I would highly recommend a stop here if you’re in the area. 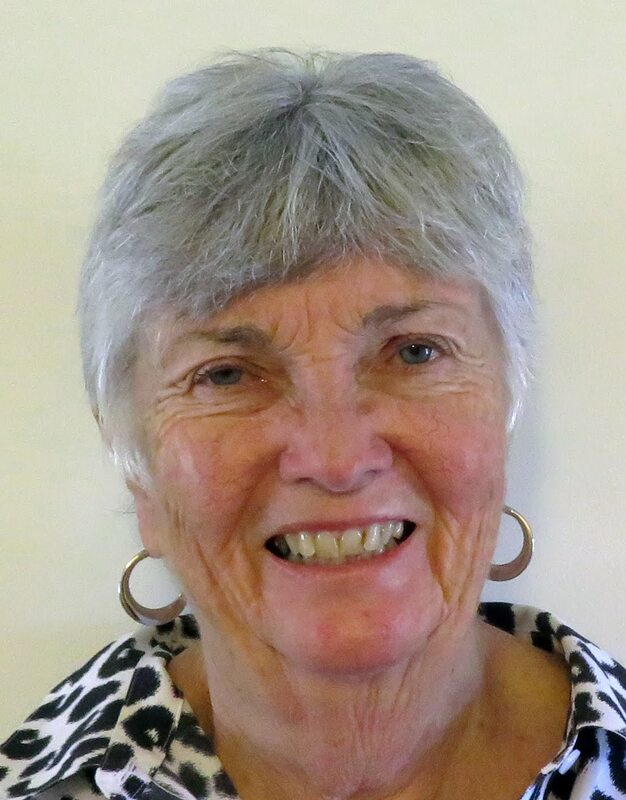 Ann was careful to discuss everything with Matthew since part of his education requirement is to learn about Florida and its flora and fauna along with its history. We stopped for lunch at LazyDays, a really great restaurant on 11th street. I had the best fish sandwich so far on this trip, just delicious! The food was great and the service was excellent and the view was of the setting sun – what more to want? The next stop was reprovisioning at the Publix supermarket which is huge. The crowd there was definitely of the grayer variety but the business was brisk, everybody had the same mission. Our dink was filled to overflowing but we made it back to the boat without a mishap. We’ll do more exploring Wednesday. It’s currently 75 tonight at 8:15 pm, very pleasant. 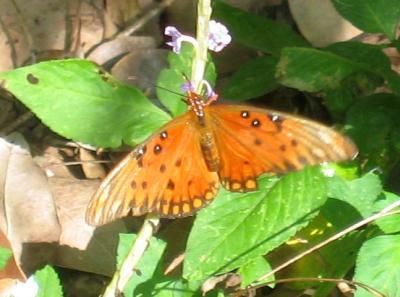 And, there’s been no insects on our trip south of Miami so far, not expected but welcomed. We’re sitting in the cockpit with everything opened up and there are no mosquitoes or flies or any insects at all, we’ll take it. One thing about marinas is that they are generally located in flat areas ideal for a morning run. I think the maximum height of Marathon is about 12 feet and the area around the marina is flatter than that. So I dinked in the morning for a 30 minute jog before breakfast. The temps are still in the 60’s in the morning but it never got much warmer today, not much sun – lots of wind still. With over 200 boats in the mooring field and more at anchor, the city marina is a huge gathering place for boaters. As in all marinas, there’s a trading library for books used by all except at this marina it’s especially large given the size of the clientele. 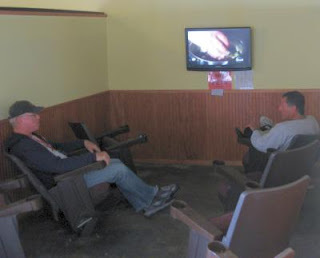 They also have small rooms off to the side with LCD panels for TV viewing. They even have a small workshop with tools for boat projects. As the price of doing laundry has risen, the method of payment has changed. It used to be that you kept a large collection of quarters on hand to feed the washing machines but now they’ve gone to smart cards which have an embedded chip that records credit payments. You take it to the cashier and give her some amount, e.g, $10 and you use it instead of quarters for feeding the machines. However, there’s one huge catch, if there is any money left over when you’re done, you don’t get a refund on the remaining amount! I’ve run into this method at three places now, good for them, bad for us. We plan on renting a car for sightseeing and reprovisioning sometime in the next few days, weather depending. The high winds of last night abated by noon but we did have a low of 51 this morning! What is not appreciated by people not familiar with the Florida climate (including me before now) is the amount of warm up that occurs during the day. When a severe cold front passes through Florida you will always hear about the low in the morning but never the high during the afternoon. We ran the genset to power the A/C for warming up the cabin and then let the sun do the rest with the enclosure. It was 70 in the cockpit by breakfast time and it quickly climbed into the 80’s (it was 85 at 4:00 pm and 70 outside). With the warm weather, we took the dinghy for a spin around the harbor which is much bigger than we thought, miles long. Even with 220 moorings, there is still room to drop an anchor if desired. There are lots of private docks too, many for rent. Wine at 5:00 with a sunset for entertainment, what more to want? Meanwhile, our 6 webcams we have around the house has kept us up to date on the storms. We have plow service from Paul and so far I’ve counted 4 plow-outs since 12/30, a record for us. Another one will probably be due Tuesday. I’m becoming more and more fond of cruising. Sure there are tight moments with shallow water and sometimes some strong winds and waves, but you visit a variety of areas and meet very pleasant people along the way. It’s been a joy with Matthew, you get to see the world through a 13 year old eyes, we’ve forgotten how that was, it was so long ago. So off we went for a late lunch around 2:00 at a local fish restaurant and saw dense, dark clouds gathering on the horizon. 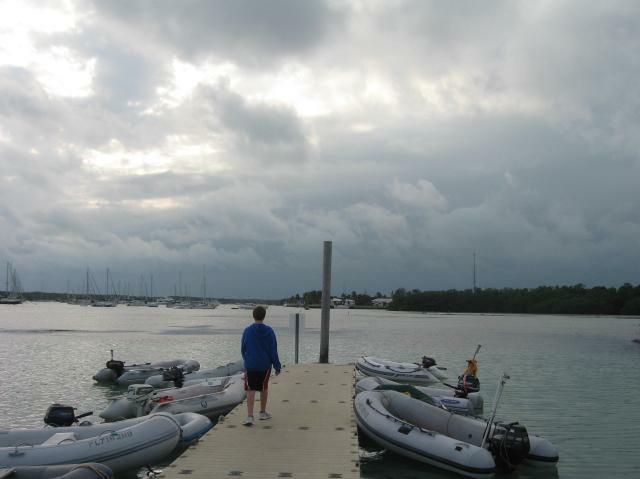 We still had time so we finished up and headed for the dinghy dock. The further along we got, the more ominous the clouds looked. The winds started to pipe up as we motored back to the boat but we got aboard before the rain came. We settled down to watch the progress of the storm. First came the blast of wind from the leading edge of the front, it peaked out at 30+ kts and has held steady between 25 to 30 right up to now, 8:30 pm. The winds are much higher a few miles out in the ocean or bay. If the storm gathers strength as it heads north, as predicted, then it’s going to be some storm! The wind is howling like a banshee – still! Luckily we’re in a very protected harbor on a mooring with no fetch in front of us, we just have to deal with the wind and it’s a short trip in for Hoolie relief. The high today reached 82 so we decided a visit to the local beach was in order that borders on the gulf. Directly south of us is Cuba with the gulf stream in-between. So we hopped in the dinghy and after a 10 minute ride, arrived at the white, sandy beach. 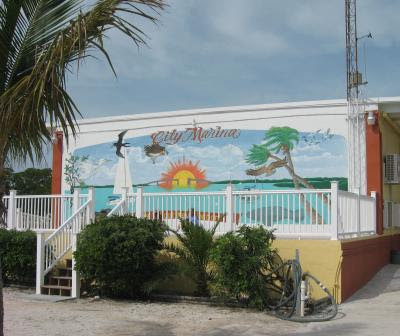 You can beach your dinghy on the canal side and walk about 100 feet to the gulf beach. There weren’t any waves of note but the water was warm and the beach sand was soft , Matthew had a good time. Rather be here or up north? Today was a school day (every day during the week) and we joke that it’s a race between Nana and Matthew on who does the homework correctly first for 8th grade math. It’s the pre-algebra course and it gets quite involved. Nana also covers French, Social Studies (doing time zone quizzes), reading reports and special projects. He’s actually getting more attention than he gets while in his school classes. This week was no contest given all the snow days up north – he doesn’t get any snow days in Florida! It’s quite an experience for all of us. I’m periodically called in to referee the math. 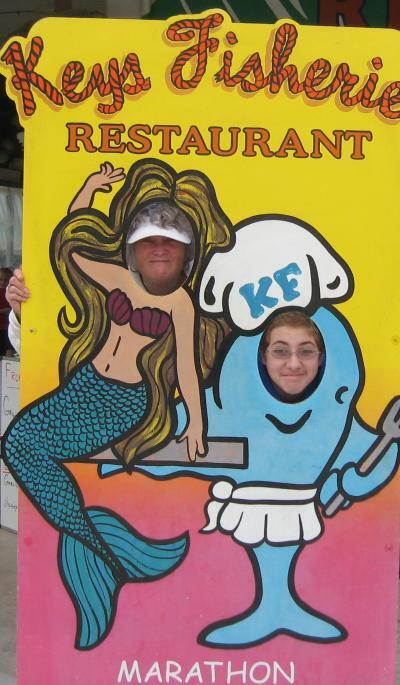 We’ll do some exploring of the city of Marathon Saturday, probably have lunch at a local fish restaurant of note. We’re going to be here for awhile. I already bought a one week ticket and we’ll probably stay a few more days before moving on to Newfound Harbor as our last stop before sailing into Key West and our dock there for February. Downtown Marathon is not like Key West. It’s just a road (Route 1) with a few strip malls on either side. There is a huge Home Depot and Publix for getting supplies and that’s good but it has no character like Key West. 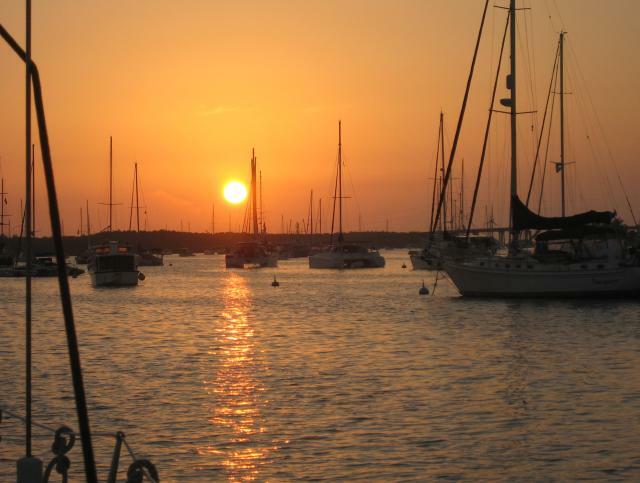 However, the marina itself is very nice and caters to the boating community. It’s the first marina I’ve ever been in that has enough dockage for dinghies! 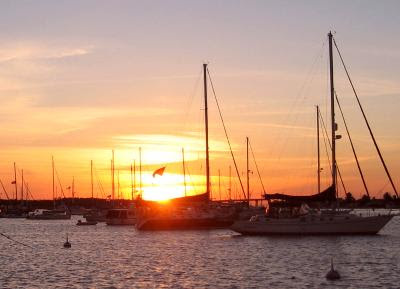 Even with over 200 boats on the moorings, there’s enough dinghy space without having to double up like at Block Island. With the highs continuing to be in the low 80’s, we’re in no hurry to move on. Matthew went for a swim off the back of the boat and on Friday we’ll go to the nearby ocean beach, we can dink over. 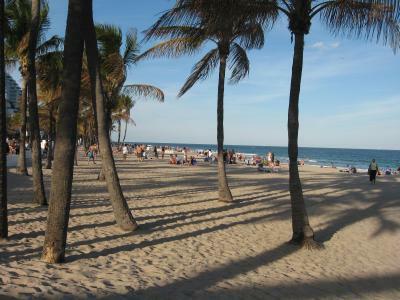 Some people spend the entire winter here, the price is right at $275/month but we would rather be at Key West. There’s a whole community here with daily “things to do”. There a local cruisers’ net every morning at 9:00 where people announce their arrival and departures followed by sponsored events of the day. 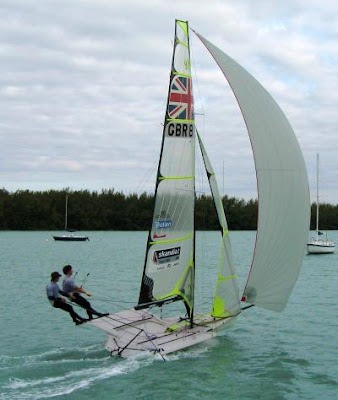 All the events are free and usually provided by one of the boaters. This morning was a Yoga class and later there was to be an art class, etc. There are covered dish suppers and all sorts of activities. It’s like summer camp for adults. A couple from Canada stopped by today to chat for awhile. There’re headed for Cuba and then Key West. We’ll stick with the USA for now. We covered about 50 miles today but there was no wind so we had to motor all the way but we did average 7.3 kts and passed several other sailboats on the way to Marathon. The city and state now runs the anchorage and have placed a staggering number of moorings, 238 in all, inside the anchorage area. In my mind, it’s a great improvement. The anchorage is now useful to many more boats. The rate is $20/day or $105/week which is a good value. They have come to terms with holding tanks, they have a free pump out boat that comes to your boat once a week and you don’t even have to be on your boat at the time. We’ve only been to one other anchorage with the same service and that was at St. Augustine. Once you start to cruise long term, such things become important. Marathon is serious in supporting their boating industry. 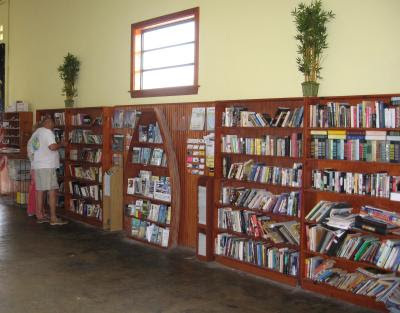 Their main clubhouse is huge with several rooms with flat panel TVs, an entire wall of books to trade, postal service (they will receive packages and mail), free WiFi and, of course, showers and laundry. There’s a Publix supermarket nearby as well as Home Depot. Some people stay right here for the entire winter. Not a bad place with the current high at 80 and the low at 70 with lots of sun. We plan on taking the dinghy to the beach tomorrow afternoon (after Matthew completes his homework for the day) for a swim in the ocean. It’s due to hit 81, ought to be nice. We heard there was snow up north, really? We got off at first light (7:15 am) Tuesday morning so we would have the high tide with us on the way out and also through Caesar Creek. The channel into Black Point marina runs for over a mile and it’s dug out to a depth of 10 feet. So far, so good. However, exactly at the exit of the channel is a spot marked 4 ft on the charts. Beyond that it’s 5 ft followed quickly by 6 ft and deeper. The exit procedure is to avoid the 4 ft spot by turning north or south. The last time I went north and saw 4.7 ft with a 1.5 ft tide so this time I decided to go south with a 1.9 ft tide. I cleared the shallows with a reading of 5.2 ft! I can only conclude that the tides somehow don’t reach there or the charts are wrong. I had a similar problem exiting through Caesar Creek. There are two entrances, a northern branch or the main western entrance. The west entrance has a 4 ft spot (they seem to be popular in these parts…) so I thought I would try the northern entrance that claimed to have 5.5 to 6.0 ft. With a 2 ft tide, that ought to be a piece of cake. Wrong! The tide station in this case is in the middle of Caesar Creek so you would think it would be accurate. I barely cleared the entrance with a reading of 5.2 ft (and this with a 2 ft tide!) The exit on the gulf side is supposed to be deep so I was surprised to see a depth reading of 5.2 ft as I exited the channel! It seems you can never relax in these channels! Sorry about all the detail but you tend to think a lot about depths down here. We were tooling along when all of a sudden our speed started to drop, a sure sign that we had picked up something on the rudder or keel. Looking back, sure enough, you could just see a shadow below the surface. As we slowed the boat, whatever it was dropped down out of reach. When we rev’ed up the engine again, it came back to the surface. I couldn’t reach it with the boat hook, too deep. So we had fun with this for ½ hour until it finally dropped off on its own accord. The rest of the way was uneventful. At the anchorage, I dived to be sure there was nothing on the prop or rudder and found both clean. 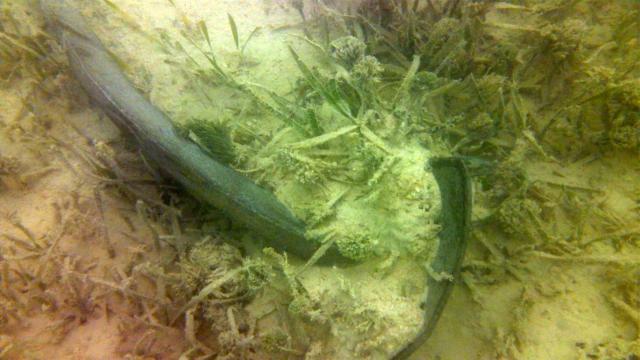 You could see the bottom and we (Matthew and I) inspected our anchor which had buried itself, no dragging tonight! 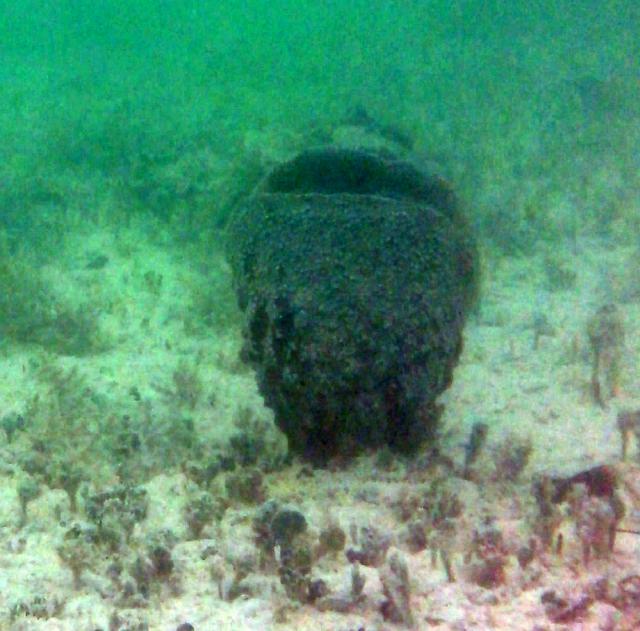 Matt dived down to the anchor for a closer look. 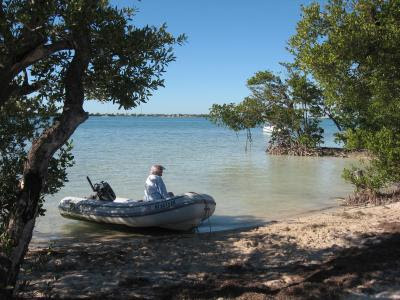 We had intended to use Rodriguez Key for Hoolie relief but found that there was nowhere to land a dinghy, it’s all mangroves. They have a root system that extends out over the water and it’s impenetrable as far as land access is concerned. So we motored almost two miles to Rock Harbor and found a boat ramp for Hoolie. Wednesday it’s off to Marathon! It started raining this morning when I had to return the rental car and hasn’t stopped all day. Rain, rain and more rain! It’s a good thing we hadn’t planned on leaving today since we would have delayed another day anyway. This is a southern rain, not the wimpy northing rain we’re used to, it rains hard! Not much to do except fill the water tanks (during the rain!) and otherwise get ready for leaving at first light on Tuesday morning. Luckily, there were just enough breaks in the rain to get Hoolie ashore but he hasn’t been ashore tonight and it’s still raining heavily now. It’ll be “white knuckle” time again getting out of here. With a 2 ft tide, we ought to have enough to get over the shallows but you never know for sure. 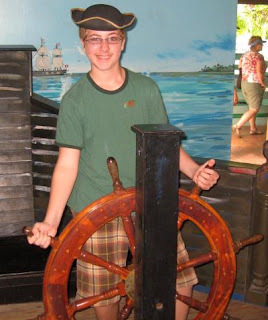 We spent four hour this morning on research for Matthew’s paper that’s due (since we’re doing the home schooling). We're trying to keep him up with his class during his southern sojourn and he’s doing pretty good at studying, it’s working out okay. Tuesday is the first day we’re supposed to see the clear gulf waters with enough visibility to see our anchor, ought to be interesting to see the anchor set. 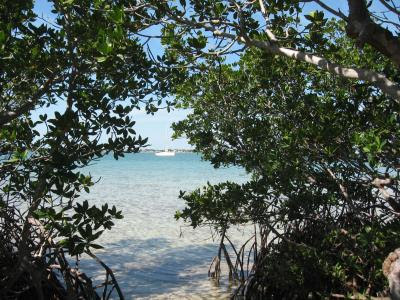 We made one last trip to the Everglades National Park today, down to the southern tip to Flamingo Park. It’s known at the mosquito capital of the world! It’s where the government tests mosquito repellant for effectiveness. If it works here, it works anywhere. 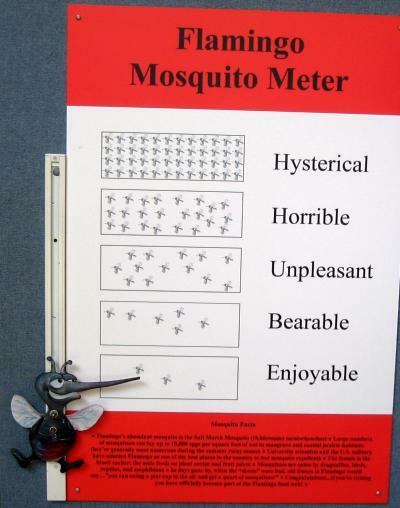 However, in January which is the dry season and cool, the mosquitoes are at their minimum so we weren’t bothered. There are sign all over the park about the importance of mosquitoes, they are an important part of the food chain – believe it or not. If you’re bitten, then the signs say that you have just become an important part of the food chain in the Everglades! You are now a participant in the food chain, albeit at a rather low point since you come in below the mosquito! So we had a relatively mosquito free day and enjoyed all the nature walks, most of which came with elevated, wooden walkways which put you at eye level with the trees for easy viewing. The “sea of grass” is rather fascinating. It looks solid but if you were to walk on it, you would immediately sink in up to your knees in the muck – or higher. After returning to the boat at 2:00 pm, the rest of the day was spent doing laundry, how exciting – but necessary. I’ll return the car Monday and work on the boat for the cruise on Tuesday. 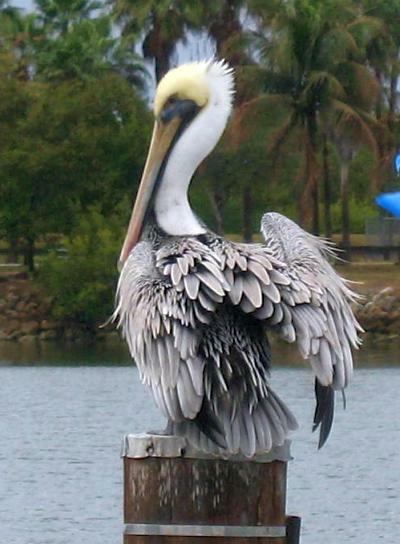 Black Point Marina – On an airboat ride in the Everglades! How do you like our pilot? No visit to the Everglades would ever be complete without taking an airboat ride! They draw about 2.5 inches of water and are driven by a V-8 engine attached to a propeller, just like on an airplane. 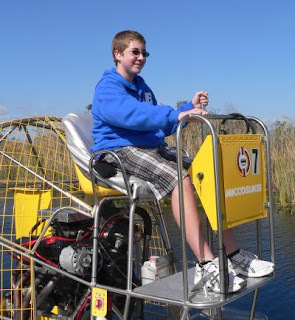 We headed north to the Tamiamt road on the northern edge of the Everglades National Park (airboat rides are not permitted inside the park) and found many places where such rides were given. We skipped all the tour buses and settled on one run by the Miccosukee Indians, a local tribe. We were the only three on the boat and had a blast. The sensation is one of being in an low flying airplane, skimming over the water, banking in all the turns as the boat skids sideways before gathering its new heading in a turn. I took videos but bandwidth doesn’t permit me to upload them yet – perhaps later. The price was right too at only $10 each. We had intended to stop by the Snake River Everglades Park but it was full and no more cars were allowed in. I guess we should have guessed that since it was a Saturday, sunny and with temps in the mid 70’s – plus a three day weekend. 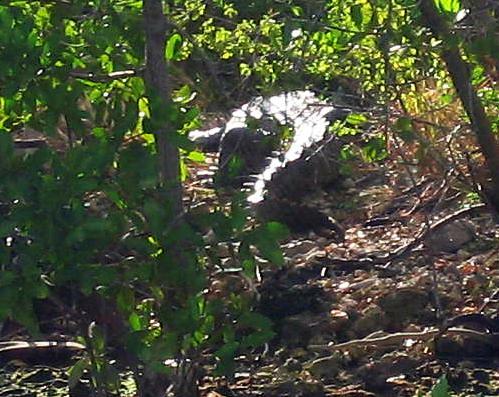 Meanwhile, I finally got a photo of the crocodile that inhabits our marina here. He’s across a 5 foot wide creek that borders on the boat launch area. We’re told that he comes out in the evening to feed on the fish pieces left over after the fishermen clean their catch. According to the locals, he’s between 10 and 12 ft long. One time he pulled himself up on the launch ramp and they had to call the local conservationists to urge him back into the water – which they did using hoses, he didn’t like the wash of cold water. I’ll see if I can get a better picture later. I rented a car from Enterprise this morning for only $27.99/day including a free pickup at the marina. We needed transportation to the park and for reprovisioning. If you’re at least 62, then you qualify for a lifetime pass to all the national parks for a one time fee of $10. It’s good for yourself and everyone in your car, regardless of age. I showed the pass and we were waved through the gate. 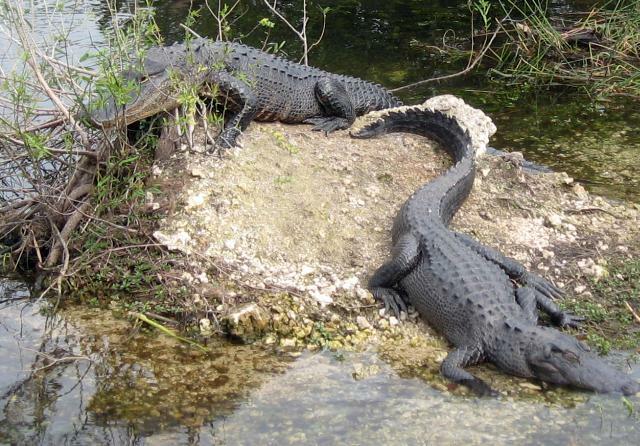 We were told that the best place to see alligators was at Royal Palm Hammock so on we went. A “hammock” is an area slightly raised above the surrounding “field of grass” so there’s some ground to walk on. A walkway led out to a pond with lots and lots of alligators. Some were within touching distance but we were all warned not to come within 5 ft of one but we were closer than that on the wooden walkway – but then the elevated walkway provided protection. There were many other varieties of wildlife all around and although they were not tame, they were very use to having people close by. You could get within an arm’s length of any of the birds before they would fly away. On the way home we restocked our orange and grapefruit supply at Robert Is Here stand, a locally famous stand that’s been in business for 50 years (robertishere.com). ﻿ The winds have finally diminished somewhat and it’s starting to warm up again. 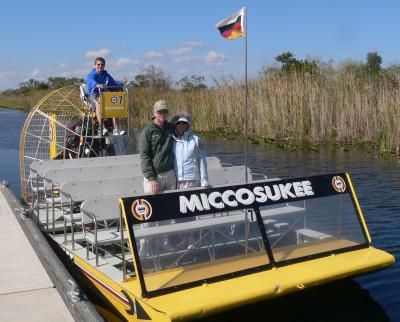 We’ll go to the park again Saturday and then take an airboat ride on Sunday through the Everglades, great fun! Well, the winds didn’t diminish much at all but we headed south anyway. It was a clear day but the temp in the morning was at 50. With our enclosure, it’s like a greenhouse and the temp reached 80 inside. With the winds directly behind us, we hoisted the jib and let the winds push us south. We are still not seeing a lot of boats. There was only one other boat visible and it was heading north. Perhaps they are all ahead of us? In truth, it was chilly today with temperatures in the 60’s but it’s due to reach 80 by the start of next week. The marina is located down a long passageway that’s been dredged to 10 ft but in getting there off the ICW involves shallow waters. As we made the turn to the marina, we were broadside to the 22 kt winds and waves. The closer to the channel entrance, the shallower the water became. I anxiously watched the depth sounder and saw it register 5.5, 5.2, 5.0, 4.9 – yikes! And then saw one reading at 4.7, oh no! Since we draw 5 ft I expected a crunching sound but it never came and as we entered the channel, the depth quickly went to 12 ft, whew! When we stopped for fuel, the attendant pointed out the local crocodile. 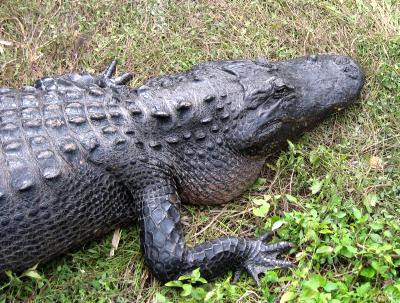 They can survive in salt water (alligators can’t) and he feasts on the remains of fish cleaning by the local fishermen. Once again we were advised to keep Hoolie on a short leash and for heaven’s sake, don’t let him go in the water! The marina is run by the state and the fee is only $0.94/ft with the BOAT/US discount (perhaps due to the crocodile?) We’ll use the marina as a base to explore the Everglades National Park. We are due to pick up a rental car Friday for transportation to the park and for reprovisioning and laundry (always laundry!) I treated the crew to a night out at the local restaurant and we are all stuffed. Hopefully the crocodile is well fed too. 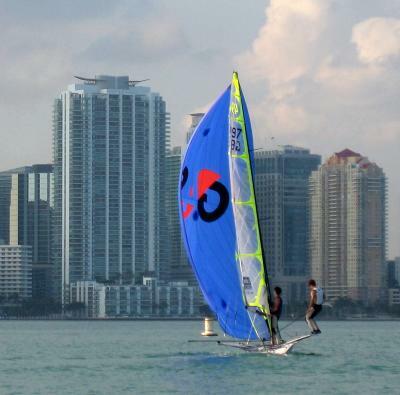 We had small craft advisory with gusts to 30 kts right in Biscayne Bay which is supposed to be protected waters! The wind wasn’t that big of a problem heading south but we had a reservation at a marina near the Everglades National Park which had a very narrow approach at right angles to the 30 kt winds. If you stray out of the channel even a little bit, you’re hard aground. With that we decided to stay another day and hope for better weather on Thursday. 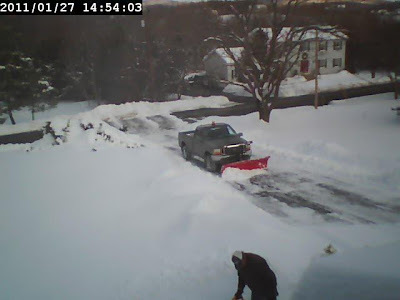 I accessed one of the six webcams around our house in New York and saw the snow from Wednesday's storm. We got 12 inches of new snow! We were plowed at 5:00 pm by Paul (thanks Paul!) We then called my son in Connecticut and found they had 30 inches and it was still snowing!! They sent us a picture of him snow blowing so we sent a picture of Matthew in his snorkeling outfit back (it was around 70 today). There are freeze warnings inland from us and it may even get down to the 40’s where we’re at. You’ll probably hear about the cold weather in Florida on the morning news. What I’ll guarantee is that you’ll never hear mentioned what the high of the day will be (that’s not news the northeast wants to hear). Well, just so you know, the high Thursday in Miami will be 68 and will climb back into the 70’s later in the week – so now you know. Meanwhile we discovered that the sailboats we’ve been seeing during the day (and also at night!!) are from an Olympic training site in the southeast corner of the harbor. We saw teams from the US, Great Brittan and Canada. We were often used as a turning point for the boats so I got a few close-up pictures. With the winds we’ve been having, they were just flying! Hopefully we can get to Black Point marina by Thursday afternoon and then on the see the Everglades National Park but the winds are still predicted to be pretty ferocious by then, we’ll see. What a glorious day! The high was 79, the wind was warm, the waves were no problem and the sunshine was out in full force. With no wind and waves, the inlets were easy. We had to go outside and not use the ICW along this stretch since one of the bridges in Miami was only 56 feet. It’s the only bridge on the ICW less than 65 feet that doesn’t open, go figure. Our mast height is a touch under 56 feet but we didn’t want to chance it. We are at the Marine Stadium anchorage. The stadium has been abandoned after a hurricane hit it but the anchorage is still here and is a perfect stopover on the way south. It’s impossible to be crowded, it’s too big and yet it’s protected from all directions except the west. There’s plenty of places for Hoolie relief, a requirement when traveling with a dog. We saw many sailing racers practicing. There must be a college nearby since all the participants were of that age. Several shells went by too accompanied by a small boat yelling instructions. Clearly they were practicing for some future event. I believe the USA Olympic team practices nearby, perhaps they were involved in today’s practices. Wednesday we’re headed south to Black Point marina and will rent a car to see the Everglades National Park which we are really looking forward to. It gets very shallow down that way with depths down to 4 ft at low tide. We’ll time our passage to take advantage of the 2 ft tide so in theory we ought to be okay (we draw 5 ft). We awoke to wind in the rigging. It was blowing about 15 kts with gusts to 25 and combined with having to brave two inlets, we decided to stay an extra day. Of course, today was supposed to be calm but the weatherman was wrong as usual. Now he’s predicting calm conditions for Tuesday, we’ll see in the morning. It was hot today, the temps got close to 80 so in the afternoon we took a hike to the beach. 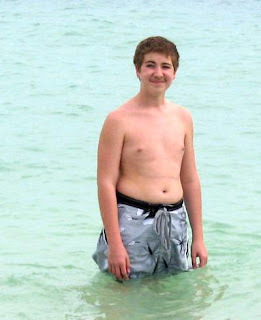 Matthew rejoiced in the waves so much that we had to pry him out. 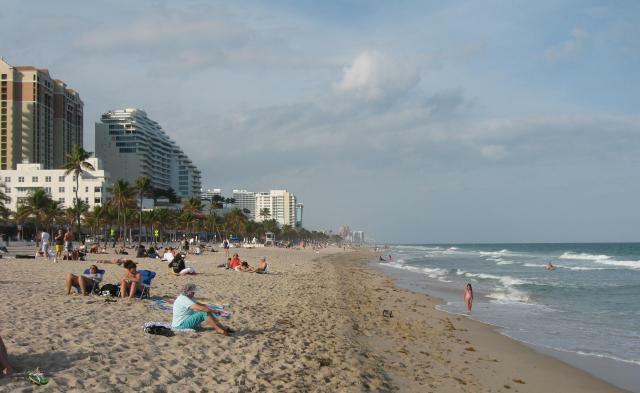 Even though it was a Monday, the beach was still crowded. We chose a spot for Matthew that was right in front of a lifeguard station plus we stayed there too. There were about 2 foot waves coming in, enough for some fun but not too much. Fort Lauderdale – 16 bridges along the way (that had to be raised)! There is a rhythm to the bridges. We found that if you can do 7 kts (and sometimes 7.3) then you can hit the bridge openings without having to wait. The bridges that open on the hour and ½ hour are followed by ones that open on 15 before and after the hour if they are close together. The most we ever waited was 10 minutes on two bridges. Most of the time we were within 5 minutes of the scheduled opening and several times we never even had to slow down. All in all, the 16 bridges added about ½ hour to our total trip time. If your top speed was 6.5 kts, you would do a lot of waiting at bridges. However, the traffic was terrific! It was a sunny, Sunday day and the ICW was packed with “Sunday drivers”. We were “bumper to bumper” by the inlets but it seemed to be ordered chaos. 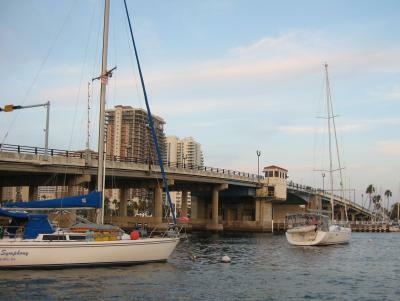 We took a City of Fort Lauderdale mooring by the ICW and was surprised to find it very calm, we expected wakes but it’s right by a bridge and it’s in a no wake zone. We took a walk to the beach which is only two blocks away and it was also packed. After all, it was 77 out with full sun, it felt like summer. Lots of young people were out and the bars were hopping. We returned to Fleetwing and watched the sun set over the palm trees before having hamburgers for dinner. On Monday we go outside to Miami. We can’t continue down the ICW since there is one bridge by Miami which is 56 feet high instead of the ICW standard of 65 feet. 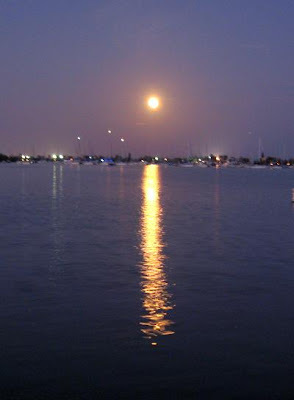 With that we’ll sail down the coast and reenter the ICW just south of Miami and anchor for the night. It’s supposed to be in the 70’s again with lots of sun, hard to take.